.Have you ever heard of a Baru Nut? These superfood nuts are super high in protein and antioxidants, making them a great addition to your diet! 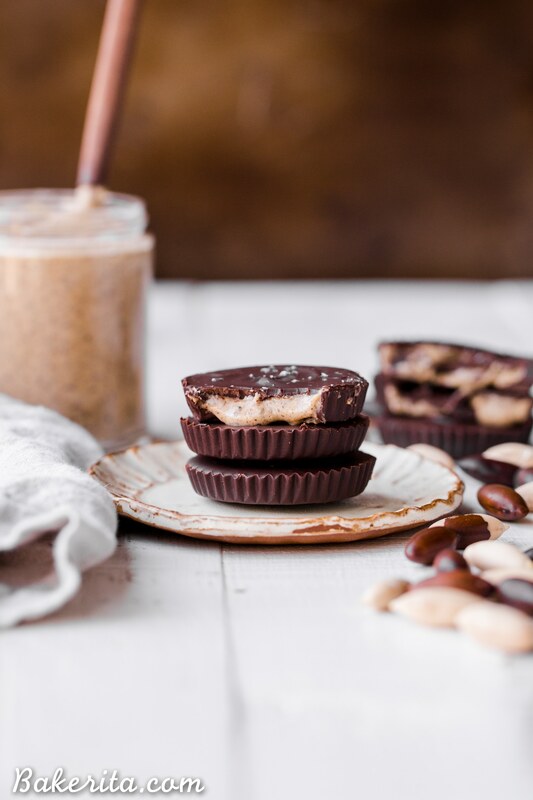 This simple recipe shows you how to make a delicious Baru Nut Butter and Chocolate Baru Nut Butter Cups. They’re gluten-free and vegan, with a paleo-option. Have you ever heard of a Baru Nut? They’re very new to me – I just tried them for the first time a few weeks ago when Nuts.com sent some over and challenged me to create a recipe using them. I scoured the internet to see what other people have made with them…and came up with a whole lot of nothing. But I did find out that they are a nutritional powerhouse that is definitely worth paying attention to. They come from Brazil and aren’t too widely available around here yet. Baru nuts are packed with protein and fiber – one 30g serving is 160 calories, 8.7g of protein and 2.8g of fiber. They are also loaded with antioxidants! I’m sure you’re wondering what a baru nut tastes like. The flavor of the baru nut was described as somewhere between a peanut and a cashew and I think that is pretty accurate. My only qualm about these is that these nuts are hard. They are definitely not as soft as say, a cashew, but you’re not going to break your teeth on them. For that reason, I wanted to blend them up in a smooth and luscious nut butter. They do have a sort of skin around them which can make the nut butter a little bit grainy (but still pretty dang smooth), so if you want a SUPER smooth nut butter, you’ll want to remove the skins. You can make this process a lot easier by popping them in a heated oven for a few minutes and then rolling roughly in a towel to remove the skins, similar to how you’d remove the skins from hazelnuts. Then, pop the nuts in the blender and get to blending! It took my Vitamix a little longer than normal because the nuts are hard, so the nut butter is extra thick. Now, here’s where you’ve got options. 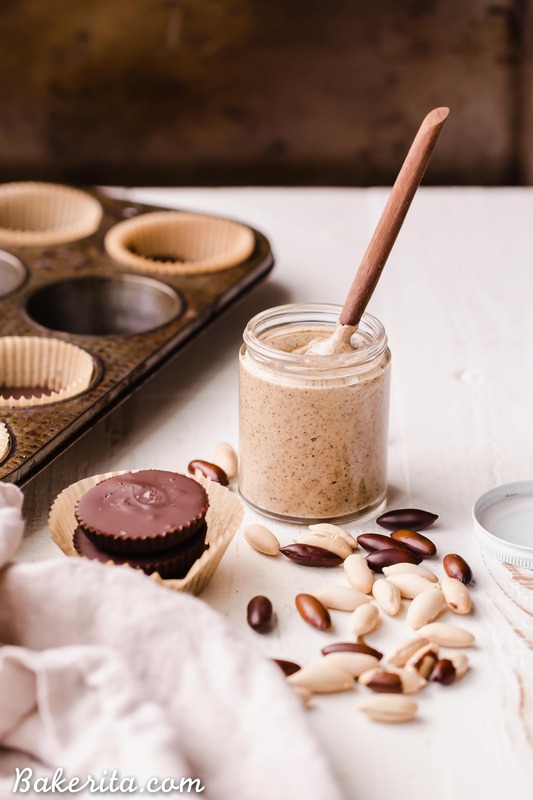 You’re going to want to thin out the nut butter to make it the most drippy and delicious. You can go for straight coconut oil to keep the flavor pure, OR add a little cashew and/or peanut butter. I opted to add a big spoonful of peanut butter to help it blend up nicely and amplify that peanutty taste a little bit. Pure, luscious goodness! I was eating it by the spoooonful. 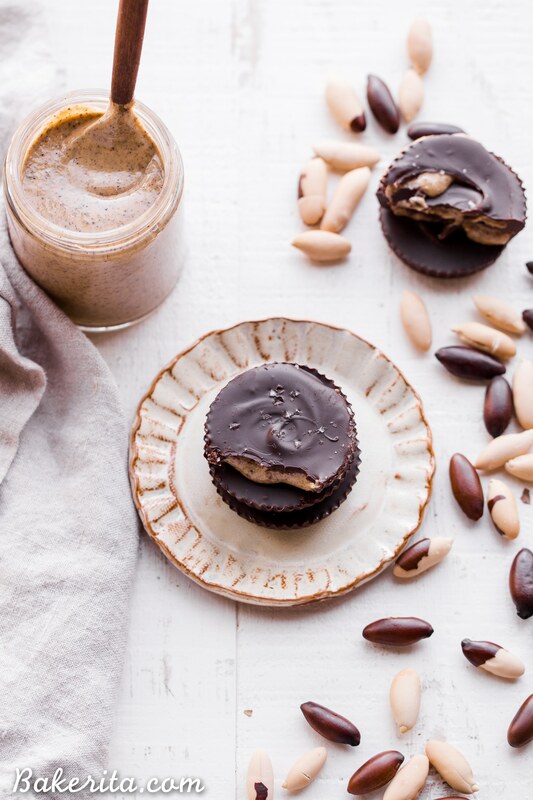 And while I love a good nut butter…I love a great chocolate cup filled with nut butter even MORE. I melted some of my favorite coconut sugar sweetened dark chocolate. 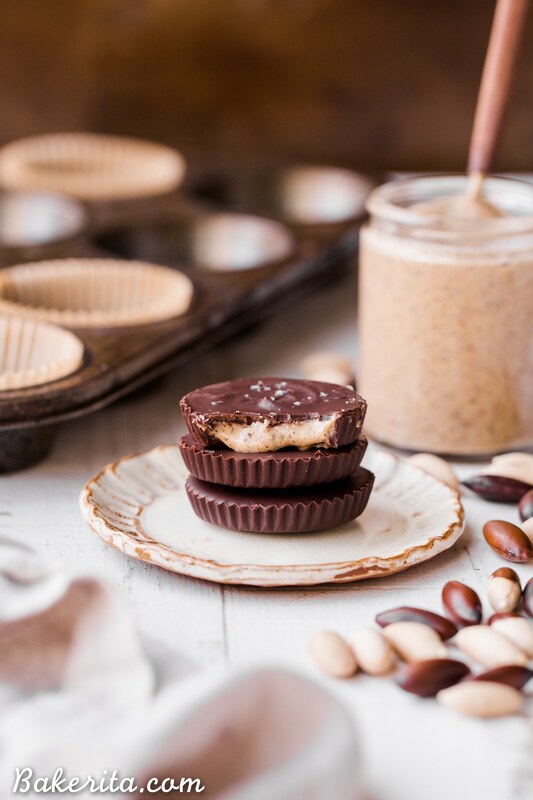 Then I swirled it into the bottom of a lined muffin pan, filled with nut butter, added more chocolate on top… Voila, dessert is served :) I’ve been munching on these delicious cups every day, and they’re SO good. This is such a delicious way to try out a whole new nut! it’s not very often I discover a new nut…and I haven’t met a nut I didn’t like just yet! You can get your hands on some Baru Nuts here to try them for yourself. Enjoy, my lovely friends! Have you ever heard of a Baru Nut? These superfood nuts are super high in protein and antioxidants, making them a great addition to your diet! This simple recipe shows you how to make a delicious Baru Nut Butter. It's gluten-free and vegan, with a paleo-option. Place the baru nuts in a high-powered blender or food processor (I use my Vitamix). Blend on medium-high speed for a few minutes or until the nuts have mostly broken down and started to form a butter. How long this takes will depend on the power of your machine. Scrape down the sides of the machine as necessary or use the tamper to keep things moving. Add 2 tablespoons of coconut oil, peanut butter, or cashew butter and blend to combine - this should make things thin out and blend more easily. Taste and add more of the coconut oil or nut butter to get it to your desired consistency and flavor. I probably added about 4 tablespoons of peanut butter. Add salt to taste - I didn’t add any because the peanut butter I used was salted. Pour into a jar and store in a cool dry place. To make the shells easier to remove, put the nuts in a oven preheated to 350°F and roast for about 5 minutes. This will loosen the shells - when they come out of the oven, put on a kitchen towel and roll them around roughly. This should loosen most of the skins. Pull off any loosened skins that didn’t come off. Have you ever heard of a Baru Nut? These superfood nuts are super high in protein and antioxidants, making them a great addition to your diet! 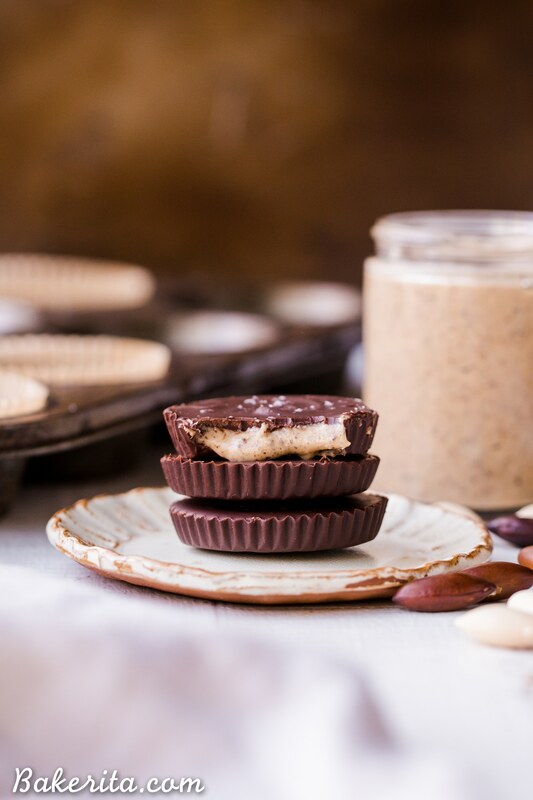 This simple recipe shows you how to make delicious Chocolate Baru Nut Butter Cups. They're gluten-free and vegan, with a paleo-option. Begin with melting the cacao butter, if using, by chopping it very finely if it’s not already in bits. Place in a liquid measuring cup and melt in 20 second increments, stirring between each, until fully melted. It can also be melted over a double boiler. Coconut oil can be melted in the microwave in 30 seconds to a minute. Once the bottom layer of chocolate is hard, place about 1 tablespoon of the baru nut butter over the chocolate. Pour enough of the chocolate mixture over the baru nut butter to cover it completely (if at any point the remaining chocolate gets too thick, warm it in the microwave for 10-15 seconds to remelt). Repeat until all are covered. Return to the refrigerator to harden completely.